A sensor is a sensor is a sensor, right? Well, not exactly. They may have some strong similarities, but there are some important differences as well. A lot of descriptions of sensors seem kind of one-dimensional because most people writing about type are intuitives. 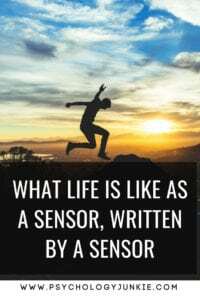 As an ESTP, I thought I’d take a shot at writing about life as a sensor from a sensing perspective. I’m going to start by trying to explain Extraverted Sensing, or “Se” for short. As an extraverted sensor I am anchored in the reality of the world around me. My senses are well attuned to details so that I can get as much information about what’s happening around me as I can take in. As I’m writing this post I can hear the happy, music-box tune of my son’s preschool show, the dripping of my coffee pot (and the delicious smell of my highly-anticipated refueling), I can see the emerald and crimson shade of the table cloth and the double shadows that are cast on it from the multiple bulbs in our kitchen light. I realize that this information isn’t necessary to me at all for writing this post, but being aware of the world around me isn’t just something I can shut off, nor would I want to. I want to take as much detail in as possible, and I want to stay tapped into what’s happening around me all the time. Why? Because then I’m prepared if I need to take action. I like stimulation. I like light, sound, sights, textures. Even when I need to focus intently on a project, it’s easier for me when I put on headphones and listen to music at the same time. I NEED the input. Even while I listen to the music on my headphones and work on my project I’m still staying tuned into the environment around me. I see everything for exactly what it is. I don’t attribute anything to an object that isn’t already there. This helps keep all the information in my brain neatly organized and filed away in just the right categories. Extraverted sensors like me can be very quick to react to what’s happening around them – a kid falling off a chair, someone slipping on the ice, or a car suddenly veering into the wrong lane, because we’re always paying attention and we don’t spend time theorizing unless we have to. The downside to this function is that we crave the use of our reflexes more than day-to-day life allows. This may be why many extraverted sensors love to get involved in sports and other physical recreational activities. These activities are an outlet for our reflexes which we want to stimulate as much as possible. The problem is, sports are considered a younger activity and something you put aside when you get to be an adult. I could always find a team to join as a teenager, but now as a 36-year-old everyone is done with sports and seems more than happy to sit in their cubicle or lounge around on the couch binging on Netflix. I grew up with two introverted sensing parents. You would think that just the fact that they were sensors would make us understand each other well. But if you’ve studied type theory for long, you’ll know there are big differences between introverted sensors (SJs) and extraverted sensors (SPs). The clash between my SP personality and their SJ personalities definitely created issues, maybe because I was a kid and just wanted things my way. Introverted sensors are still quite aware of the world around them but because it’s an introverted function, it’s all about how it relates to them subjectively. When was the last time they heard that song on the radio? Who gave them the sweater they are wearing? Why aren’t we going to that restaurant? Well…that type of food is unfamiliar. It’s all about their experiences and their impressions of that experience. It’s about comparing and contrasting past to present. They like familiarity, routine, structure…all things that make SPs like me feel a little queasy inside. Of course, introverted sensing can be really valuable because the people who use it often have a good memory for the past and are realistic about the future. They can remember details and lessons and apply them to current situations effectively. They preserve positive traditions (or bad ones if they’re bad guys). They tend to be reliable and keep their word. I, on the other hand, as an ESTP am incapable of keeping any of my promises and only live for hedonistic, shallow pleasures….wait, sorry…that’s what the personality community would like you to think. But be wary of stereotypes, even if these personality systems are highly-nuanced forms of stereotyping. I remember growing up as the youngest brother of two older sisters. Even though they were four and six years older than me, I was usually able to keep up and compete with them physically. Being as it was the 80’s, we spent A LOT of time playing outside, riding bikes (without helmets), roller skating in the drive way (without knee pads), playing tag, hide-and-seek, swinging on our rope swing and finding as many ways to keep busy as possible. For me, it was perfect. I loved the action-oriented play and was able to compete with children much older than me very quickly. I learned how to ride a two-wheel bike by sitting on the cross bar of my sister’s much bigger bike. I figured out how to cut sideways when being chased to avoid being tagged. All of it was about figuring out how to physically manipulate either myself or the world around me to my advantage, and I loved every second of it. Once I became a teenager I started playing in a church softball league. I loved the challenge and the physical demand it placed on me. I was the pitcher for our team and often had to react quickly when a batter hit a ball right back at me. Sports has given me a rush and excitement for life that has never left me. It requires complete concentration on exactly what is happening in that moment. It’s about reacting at full speed. The world we live in is designed by sensors. Sensors account for 73.3% of all personality types. We are drawn to the world around us because it was designed for us. This is obvious in the majority of TV Shows, movies, and video games. Special visual and audio effects that provide sensory overload are a delight to an extraverted sensor, but can be overwhelming to an Intuitive. Advertising for the new faster, better looking, better-feeling….thing works for sensors, but doesn’t hold any deeper meaning for the intuitive. Now none of this is to say that Intuitives don’t enjoy movies or new things or anything like that. But they often get their enjoyment out of them for completely different reasons than we do. So while the type community is over-represented by intuitives, I’ve found that many of them want to have a deeper understanding of sensors. I also think it wouldn’t hurt us to have a better understanding of them! 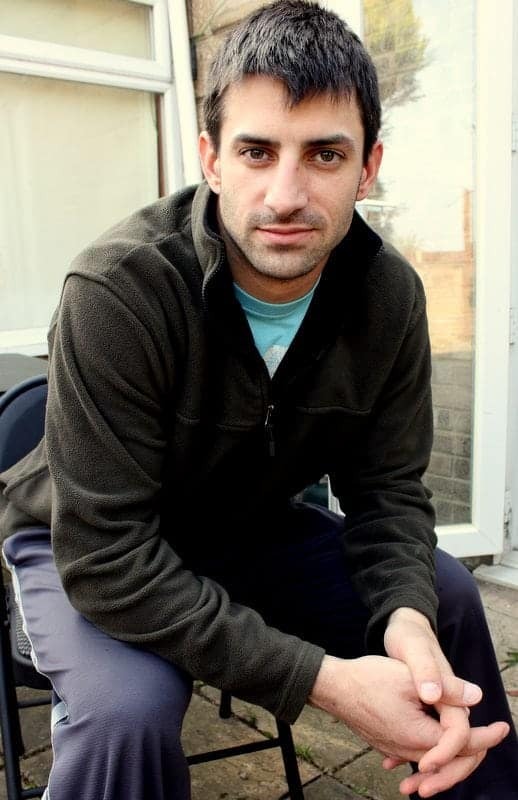 Daniel Storm is the husband of Psychology Junkie founder, Susan Storm. He loves playing sports, tinkering with technology, gaming, and enjoying life with his wife and five kids! He is an ESTP personality type and is on a quest to rid the world of negative sensor stereotypes! 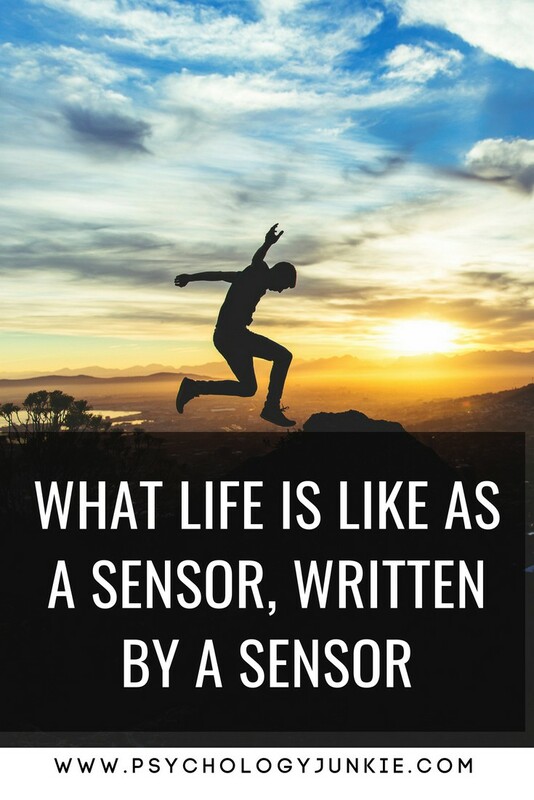 What Type of Sensor Are You? And, I would say that some sensor may have a taste for the abstract. I practice skydiving, and I am here. What differentiates me is that I would not pratice psychology as profession. But I like to use psychology in more concrete areas. First of all. I would love to go skydiving. Second I completely agree about using psychology in a concrete way. I would love for more sensors to at least take the time to learn about type and see all the ways it can be used in everyday life! Yes I would say that there is a difference between loving the idea, and doing everything to realize this idea… Personally, I left the city to lead a life that allows me to practice more unusual activities. I think all SeInf can attracted by the idea. But probably the vast majority will never do it because the step between “possibility” and “action” is a bit more complicated than for other type. Especially this type of action. I think you need a major reason. Like defending someone, or making a plan… Or cause the plane is crashing. But if you have a STP as a husband, this could be done. Besides, I prefer to use the “strategy” term for INTJ, rather than “plan”. As a Ti Dom, I’m looking for precision, which in some areas, goes hand in hand with planning. And I love that. The goal is not to communicate my thoughts to organize durably the outside world. But the Maximum impact with the most precision. Nice article! I’m an ISTP and another thing I’ve noticed is Se is VERY aware of every movement you do or make, very conscious of it. While an Ne-user I know will start doing something and say, “Wait, did I start doing this?/How did I get over here?” and all I can think is, “How can your body be on autopilot, how can you not notice what you’re doing?” It’s pretty funny. LOL… sooooo true. It can actually be annoying when the only other people around are Intuitives too and are equally spaced out about how I ended up here/there or why I came into the room. They will usually be triggered to talk about something completely random, which of course I get sucked right into, and then I only end up remembering days later that I still haven’t found the thing I was looking for on that day that I got distracted. GASP. That’s probably why *both* of my best friends are Sensors – I need them to keep reminding me what the hell I’m doing on this planet. I love being able to read about sensors from a sensor’s point of view. Keep the awesome articles coming, Daniel! Thank you for the new article. 🙂 This was very informative and it managed to explain the essence of how Se works. It must be fantastic living a life with using Se you are capable of always enjoying the present, this is something many people shall experience. But the worst of all that I just don’t feel the urge to move. I always prefer just sit or lay down and I don’t want to do sports or go outside, that just exhausts me especially after a long day. I only want to read, to solve a problem calmly, to play video games or to write a story. Motion, doing sports are just disturbing “should haves” in my life. And I know this is unhealthy but I just don’t feel right to start moving. I would like to change that! I would like to learn this from the Se users, how I can be happy in the present and how to be able to desire to go out and start moving. I really count on your writings so with your help I will be able to change it and live a more balanced life after all. 🙂 So thank you again for this. Have a wonderful day! Can I know which game you play? The best thing is to find an interest in a particular sport. For all types.